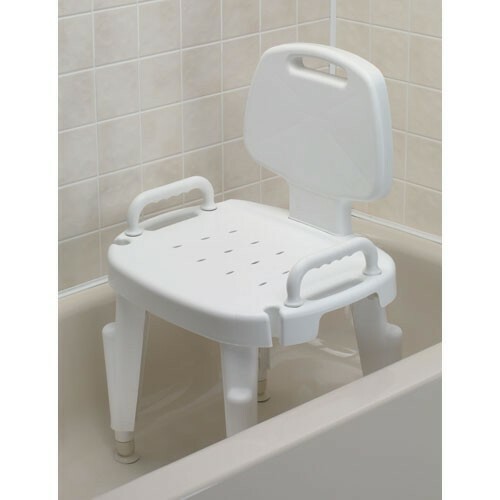 Bath Safe Adjustable Shower Seat is a durable, safe solution for people who need extra assistance and support while showering or bathing. This medical shower chair can support up to 300lbs and is 100% rust proof. This shower chair with back features height adjustable legs, strong suction feet to keep the unit stationary, and a built-in shower spray holder that is completely hand held. Bath Safe Adjustable Shower Seat is a safe, reliable, and durable medical shower chair that is ideal for a wide variety of people, including geriatric patients, bariatric patients, patients with limited mobility, and patients recovering from surgery or a similar injury. This shower chair with back can help reduce the amount of strain inflicted on the body while showering, specifically for patients who have difficulty standing upright or moving in/out of the shower or bath. You may also be interested in similar shower aid products, such as the Adjustable Corner Shower Seat. Height adjustable legs (16-21 inches). Strong suction feet to keep unit stationary. Contains built in hand-held spray holder to reduce patient/caregiver stretching and bending. Item F727142501: what is the depth and width of the seat? Depth of the product is 7.5 inches according to the manufacturer. The overall width is 30 inches and has leg height adjust-ability of 16-21 inches. A transfer seat is better able to help the user slide from one place to another while remaining in a seated position.